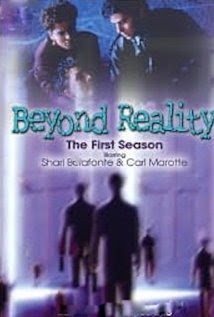 Beyond Reality was a Canadian TV show which ran from 1991 to 1993 and was one of the first shows to be on the original lineup of the Sci-Fi Channel after it's initial run on the USA Network. The show had a similar concept as shows such as Poltergeist the Series and Friday the 13th the series. Basically the premise was two experts in paranormal activity played by Shari Bellafonte and Carl Marotte help someone every week who's dealing with some type of paranormal phenomenon. In this episode from the shows 2nd season they take a bit of a break from the normals of the show and instead do a bit of a period piece. A stranger reads the tale of one of the main characters great grandfathers dealing with vampires which is played out on screen by the regular stars of the show. De Boer normally plays the role of "Celia" on the program but on this episode she is Mrs Winters, a 19 year old who has been struck ill and called on a young Doctor to fix her (The ancestor of the character J.J.). They instead fall for one another but before anything can happen she dies. A woman then tries to convince Dr. Baker that her sickness isn't over and that she was going to come back but of course he didn't believe her. Obviously that is exactly what would happen and the woman who's name is Ariel (Bellefonte) saves him by shoving a stake through Mrs. Winters heart just as she was about to take a bite out of him. The scene was your run of the mill "Female vampire seduces guy then tries to bite" scene and you can never go wrong with those. forgot about that one! thanks.